As Ayurveda is becoming popular and complete Ayurvedic courses are being conducted at various Institutes throughout the World, students are now asking for Ayurvedic text books on advanced subjects. 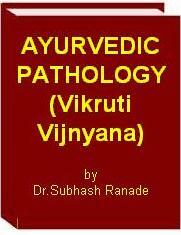 Vikruti vijnyana or the concept of pathology is the clinical subject of second year B.A.M.S. and if it is properly understood, then only one can correctly diagnose the disease and treat the same. This ebook has been written specially taking into consideration students in foreign countries. Causative factors of the diseases etc. Other Payment Mode Options are HERE. For Indian Residents,other options to Make Payment in Indian Rupees are HERE. Please note - You will not be taken to the download page automatically, after completing your payment. After receiving your payment information I will send you the download link and password. Please allow me few hours time for that. Please add our email ID 'editor@ayurveda-foryou.com' to your address book (or "buddy", "safe", "approved", or "trusted sender" lists) to ensure that you will receive replay from us. Please don't forget to check your 'Junk mail' folder also for our replay. 1. Importance of Dosha-Dhatu-Mala Vijnyana Introduction, Samanya, Vishesha - homologues -heterogeneous, Definition of health, nature of vikruti, Dashavidha Pareeksha. 2. Nature of Vyadhi hetu Trividha hetu – Asatmya indriyartha samyoga – Shrotrendriya –Ayoga, Mithya yoga, Ati yoga; Sparshanendriya - Ayoga, Mithya yoga, Ati yoga; Chakshurindriya - Ayoga, Mithya yoga, Ati yoga; Rasanendriya - Ayoga, Mithya yoga, Ati yoga; Ghranendriya - Ayoga, Mithya yoga, Ati yoga; Prajnyaparadha- Dhi, Dhruti Smruti bhramsha; Parimana. 3. Dosha avastha –Pathological conditions of doshas Dosha vaishamya, Dosha kshaya, Dosha kshaya hetu, Dosha kshaya laxana- Kapha kshaya, Pitta kshaya, Vata kshaya; Dosha vriddhi, Dosha Prakopa hetu, Vata Prakopa- Ahara, vihara; Pitta Prakopa –Ahara, Vihara; Kapha Prakopa –Ahara, Vihara; Chaya, Prakopa, Prashama; Shat Kriyakala- Stage of chaya, Etiology of Chaya, Symptoms of Vata chaya, Pitta Chaya, Kapha Chaya; Prakopa – Vata Prakopa, Pitta Prakopa, Kapha Prakopa; Prasara. 4. Doshagati and Vyadhimarga Introduction, Koshtha- Shakha, Relation of doshas with Koshtha and shakha, Interrelation of Koshtha and Shakha, Dosha gati -movement of doshas, Vyadhi Marga-disease tracts – Koshtha marga, Shakha marga, Madhyama marga;, Causes of transit from Koshtha to Shakha, Effects of transit of doshas from Koshtha to Shakha, Methods of bringing doshas from Shakha to Koshtha, Yoga and Ayurveda, Panchakarma, shuddhikriya, pranayama. 5. Contributory factors for Vyadhi Five essential factors for formation of vyadhi, 1. Role of dosha- Specific symptoms of Vata, Pitta and Kapha; Different types of vitiation of dosha- Prakruta-Vikruta; Svatantra-Paratantra, Prakruti-Vikruti; Doshagati, Samsarga-Sannipata. 2. Role of dushya- organs and channels, Srotovaigunya, Etiology of Srotovaigunya, Srotodushti, Symptoms of Srotodushti; 3. Role of Agni, Etiology of vitiation of agni, Symptoms of vitiation of agni, 4. Role of Ama, Etiology of vitiation of ama, Symptoms of vitiation of ama- Symptoms of sama and nirama dosha, symptoms of sama and nirama dushya and symptoms of sama and nirama mala. 6. Vyadhi Definition, Synonyms, Classification- Trividha, Chaturvidha, Roganika, Aushadha sadhya- Shastra sadhya, Trividha – Adhibhautik, Adhidaivik, Adhyatmik; Dvividha; Sadhya, Yapya, Pratyakhyeya; Samanyaja –Nanatmaja, Nanatmaja vyadhi of Vata, Pitta and Kapha; Santarpanottha, Apatarpanottha; Indriyajanya, Upadhatu pradoshaja, Malajanya, Vyadhinanatve hetu. 7. Vyadhi Avastha Introduction, 1. Stages occurring due to changes in dosha – Vegavastha-Avegavastha; Doshapaka. 2. Stages occurring due to changes in dhatu –Dhatupaka, Dhatugatavastha- Nava-jeerna, Uttana –Gambhira; 3. Stages occurring due to Srotorodha- Srotovaigunya, Antarvegi- Bahirvegi; 4. Stages occurring due to changes in agni and ama, Ashukari-Chirakari, Importance of the knowledge of stages of the disease. Symptoms of dhatugatavastha of – Jwara, Masurika, Kushtha, Vata Vyadhi. 8. Sadhyasadhyatva Chikitsapada -Padachatushtaya, qualities of vaidya -physician, paricharaka-attendant, aushadha-medicine, rugna-patient, classification, Qualities of the sadhya vyadhi, Qualities of kashtasadhya, Qualities of the yapya vyadhi, Qualities of pratyakhyeya vyadhi. 9. Vyadhikshamatva -Immunity Definition, Relation between Bala and Ojas, Avyadhisaha sharirani- persons incapable of resisting diseases, Vyadhikshama sharirani- persons having good resistance against vyadhi, Ashtau Nindita, Ojo dushti- Ojovyapat, Ojovisramsa, Ojakshaya. 10. Dushya –Sroto Vikruti Vijnyana Pranavaha srotas, Annavaha srotas, Udakavaha srotas, Rasavaha srotas, Raktavaha srotas, Mamsavaha srotas, Medovaha srotas, Asthivaha srotas, Majjavaha srotas, Shukravaha srotas, Artavavaha srotas, Mutravaha srotas, Purishavaha srotas, Svedavaha srotas, Manovaha srotas. 11. Janapadodhvamsa –Epidemic diseases Introduction, Etiology –Asadharana hetu, Bahujana sadharana hetu, Inevitable disastrous factors – effect of planets, Evitable factors –Adharma, Shastra prabhava, Abhishapa, Rakshogana -Bhutasanghata. Nature of janapadodhvamsa vyadhi- vayu, jala, desha, kala. Remedies for prevention and treatment of epidemic diseases. 12. Nidana Panchaka Study of the disease with five methods. 13. Nidana Definition, Types- Category I- trividha nidana, Category II –Sannikrushta, Viprakrushta, Vyabhichari, Pradhanika; Category III – Doshahetu, Vyadhi hetu, Ubhaya hetu; Category IV – Utpadaka hetu, Vyanjaka hetu; Category V –Bahya hetu, Abhyantara hetu; Importance of knowledge of etiology. 14. Purvarupa Definition, Types –Samanya –Vishesha; Sharira, Manasa, Sharira-Manasa; Importance of knowledge of purvarupa. 15. Rupa Definition, Difference between rupa and vyadhi, Types –Vyadhi pratyanika laxana, Doshaja, According to avastha, Atura samvedya, Vaidya samvedya, Importance of knowledge of rupa. 17. Arishta Definition, Development of Arishta, Symptoms of Arishta, Types of Vikruti in Arishta laxana, Ashta Mahagada. 2. Role of dushya in Samprapti - I) Diseases of vitiated Kapha, ii) Diseases of vitiated Pitta, iii) Diseases of vitiated Vata. 3. Role of Sthana-samshraya in Samprapti. 4. Role of Dosha-dushya-sammurchana in Samprapti. 5. Samprapti and kriyakala. Vyakti, Bheda, Types- Sankhya, Vidhi, Vikalpa, Pradhanya, Bala, Kala; Importance of Samprapti. Select the ebooks you want. Calculate the total price you will require to pay for these ebook. # You can directly transfer the required amount in my account. # Deposit any local bank check of required amount in the IDBI bank near you, in my account with details as above. # You can also Transfer funds from Other Banks to IDBI Bank using Netbanking service and transfer funds by NEFT. Please send your payment intimation to 'editor AT ayurveda-foryou DOT com' along with list of ebooks you have purchased.